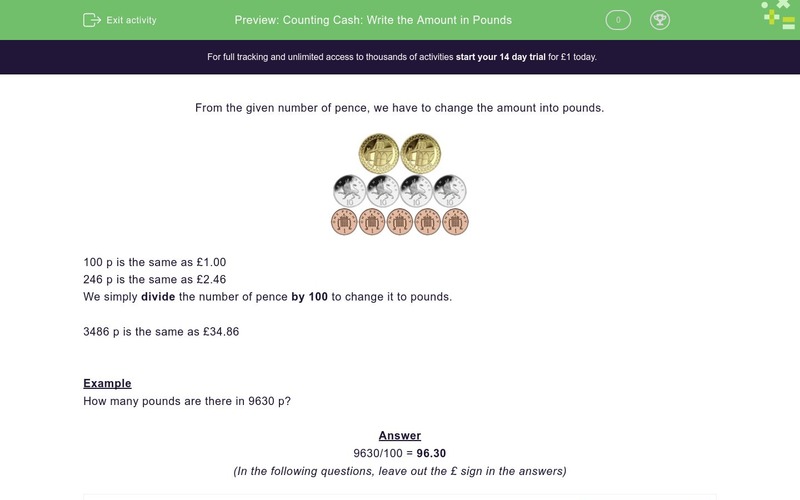 In this worksheet, students convert an amount given in pence into pounds. From the given number of pence, we have to change the amount into pounds. We simply divide the number of pence by 100 to change it to pounds. How many pounds are there in 9630p? How many pounds in 9981p? Remember, just write the number, don't include the pound sign. How many pounds in 1675p? How many pounds in 1438p? How many pounds in 7710p? How many pounds in 9863p? How many pounds in 4040p? How many pounds in 1331p? How many pounds in 474p? How many pounds in 6071p? How many pounds in 8237p?